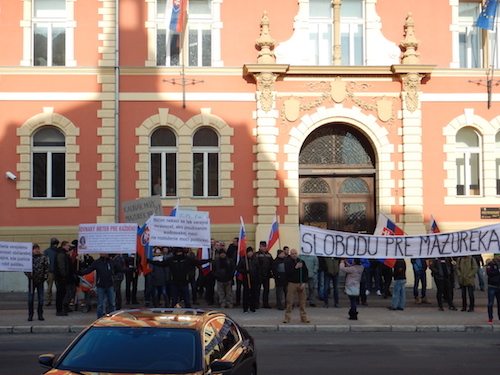 Bratislava We were on our way to Bratislava, but first we had an opportunity to observe some kind of action by the members and supporters of the far-right party in Slovakia. More recently, this party, referred to invariably by our hosts as neo-Nazis, had been the governing party in the country in a Trump-scale surprise to many voters who were overwhelmed by the protest vote that propelled them into power in 2013. 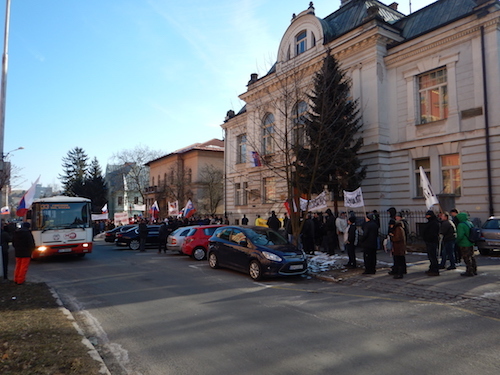 The occasion of the action was a court proceeding scheduled for 9am in Banska Bystrica involving one of their members who they believed had been arrested unfairly. The court has limited seating for only forty in the audience so our associates expected there would be a line of people seeking admission and contending with the opposition. With a bus to catch, our delegation had no interest in what was happening inside the courtroom. 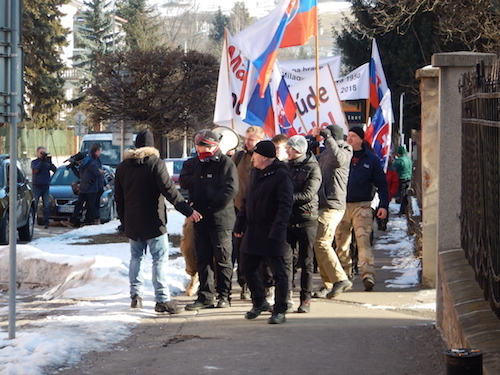 Our interest was in what we could learn of the strength and tactics of the far right. We may have learned more than we wanted to know. When we first arrived about 915 AM, there was a nothing much happening. Two or three policemen were wrapped up against the cold, standing on a corner across the street, a block from the courthouse door. 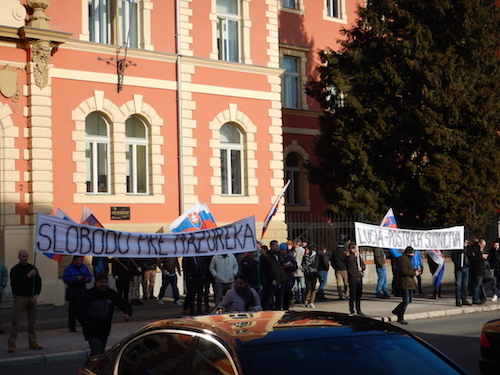 Compared to what I had seen in Bulgaria, where police sometimes outnumbered protestors, this was a light touch. 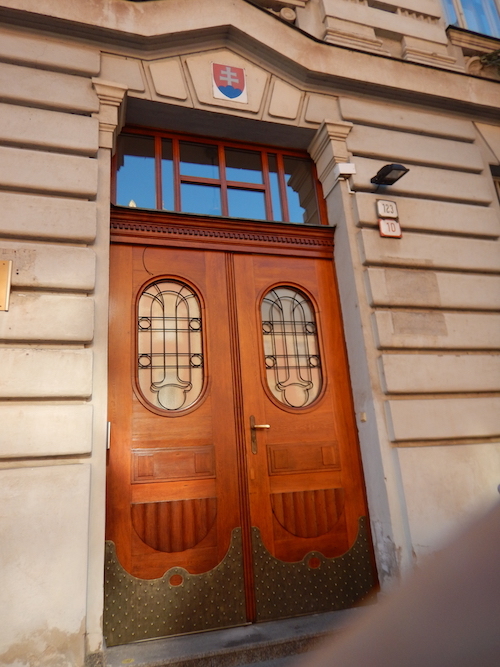 There were no police in front of the court’s door and no sign that there was any expectation of violence or that people would try to force entry into the building. In fact, there was just a somewhat scraggly and, frankly, disappointing gaggle of perhaps twenty men with a couple of flags and banners standing along the fence line between the driveway and the sidewalk abutting the entry door. Shortly, we discovered that this was simply a staging and holding team. Ten minutes after we arrived about fifty to seventy marchers came down the sidewalk across from where the policemen were standing with more flags and banners and assembled across the street from the court building. 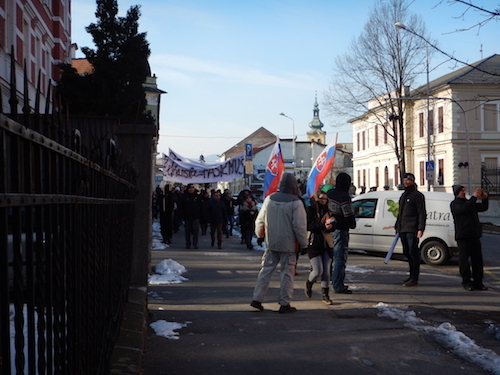 Another five minutes passed and one of our number checked the news on his phone and turned to us and said that the far-right protestors had two other march columns coming, one from down the hill and the other from the central town square. 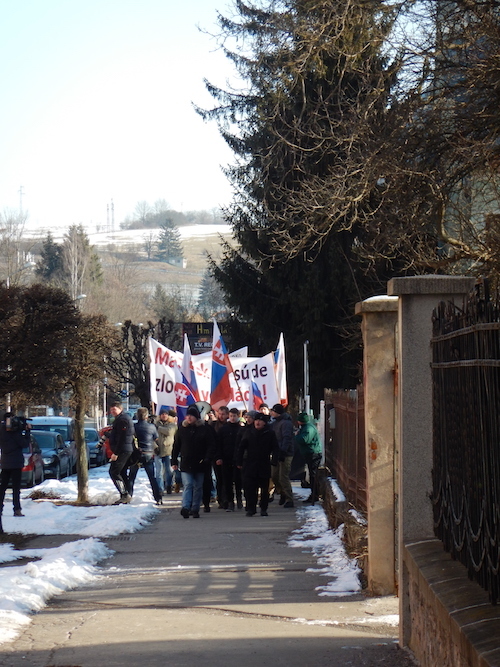 Minutes later, I could spot the banners coming up the hill some blocks away, and they looked strong and together, banners unfurled, and, as they neared, chants roaring, Slovak flags flying everywhere. There may have only been a hundred, but they stretched for several blocks and looked – and sounded – like more. 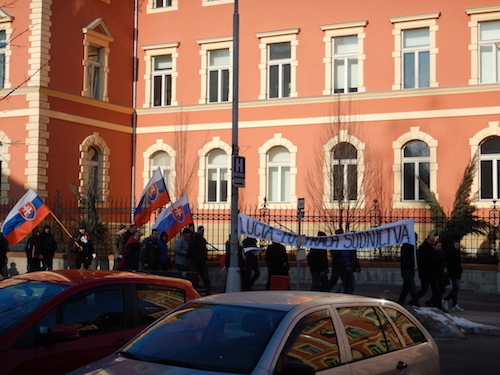 Very deliberately they marched right up to the court’s driveway, then turned, and all crossed the street where the first elements of the march were now arrayed. Once assembled there, the original holding band went across the street with their banners to join them. Another five minutes later the smaller group, perhaps fifty, came up from the square and joined them. I’ve done this before many times. It takes organization and some tactical imagination and planning, even if their timing was imperfect. They had more than two-hundred across the street, letting it roar by 940 AM or so. Most were men, with a handful of women, and two children. Any organizer will tell you that pulling out 200-plus “day-timers” on an early Monday morning, takes not only real organizing, but speaks to a real organization with a significant base. No matter the message, as a demonstration, it was impressive, and something to be taken very seriously. Our escorts translated the signs for us. They were wrapping themselves in democratic and patriotic slogans. 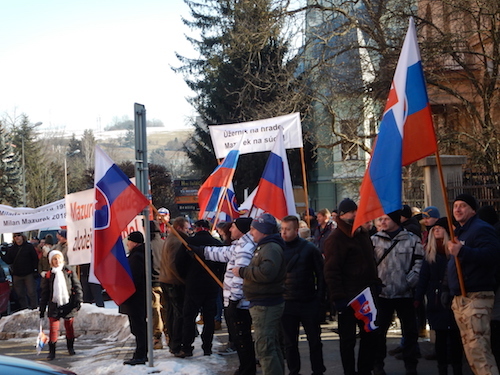 The flags were national Slovakian banners. Their signs argued for free speech. 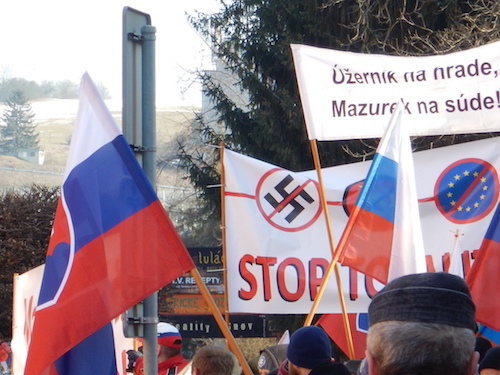 One banner crossed out the Nazi, EU, and Communist symbols, indicating they were native and distinct. There was message discipline. No signs attached immigrants, Roma, or others, while all of them supported their colleague before the bar. Some of our hosts carped about them not having a permit or permission and hoped the police would break up the demonstration. Once again, they missed the skill and planning behind these marches and this courthouse rally. They didn’t need a permit, and our friends shouldn’t have wanted them to have one, because their hands would be tied in the future as well. We never ask for a permit. They had obviously already assured the police that they would be disciplined and peaceful, and they were proving it. Progressives may have won the last election in this region in the fall of 2017, but these folks have to be taken very seriously. They are smart, well-organized, and committed to a longer struggle, and winning will require much, much more of the same on the progressive side of the line and an organization with comparable, if not greater, strength. Please enjoy previously unreleased Jimi Hendrix’s Lover Man.